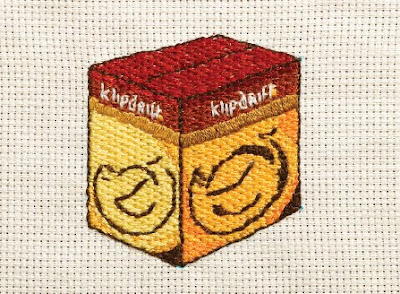 First there was the knitted Klipdrift bottle; now here's the embroidered crate of Klippies! Different shades of colour and everything. Late nights and a lot of learning. This is amazing! Behold the detail indeed! And the knitted bottle is mind-bogglingly clever too. oh my goodness! did yo do both? 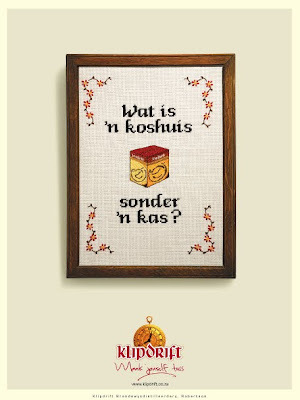 i love their advertising campaigns; they're so inventive. What a great advert! I am impressed by your cross-stitch - I have just recently become fascinated by embroidery. Have been battling to find suitable fabric, though. Where did you find yours? "what is a residence without a cache??" did google get that right? do they mean a stash of klipdrift? and what is klipdrift? sorry for all the questions, my curiosity is getting the better of me. Love the chickweed from your previous post. Something like that ;) "What is a residence without a case?" Klipdrift is brandy, but there's also a pun (sort of) because 'kas' also means cupboard. Thamks, Jesse, the curiosity was killing me, we definitely don.t have it in Ireland. The knitted bottle is brilliant but I couldn't tell what was in it! Me again. You can get cross-stitch fabric online from www.charlescraft.com They used to do quite small quantities in a rainbow of different colours but they have merged with DMC so I don't know if they offer such a wide range anymore. They also offer a choice of "count"(density). 14ct is standard and equivalent in scale to working over two threads on 28ct linen. Wow, imagine that! I love embroidery but don't do it often enough. Congrats on being in the new Crochet Today mag! My copy should arrive in the post anyday now. Thanks for the fabric source, Tracey! Wow! A real work of art! So clever.